Absinthe without aniseed originated early outside France, particularly in Czechia and Germany where aniseed is still not really a preference in taste. Herbal draughts with a very strong taste of bitter. Ranges from the high quality bitter with rich natural green colour, harmonized recipe and very strong flavour down to notes that will surprise at first and take a while until you get accustomed to them. 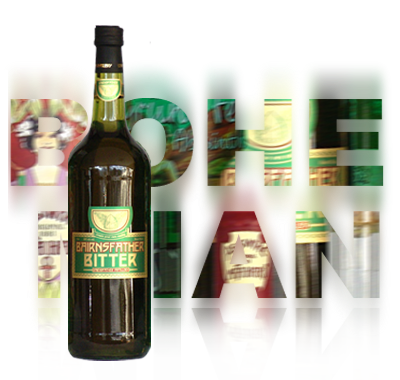 All types do have the distinct typical impact of Absinthe. Drinking recommendation: on the rocks – or flamed with sugar and only 1-2 parts of water. Czech Absinthe – in Prague you'll find it in any shop or bar. Distinguishable from a distance by the radiant green of the artificial colouring. Often a high-proof Vodka serves as a base to which essences are added. Touristst who don't know Absinthe are usually amazed by the effect. Drinking recommendation: flamed with sugar and 3 parts of water.